Read on about a masterful use of light and the viewer’s basic human nature to draw them into the painting, and maybe even the subject’s state of mind. As a person with visual impairment, consider questioning why details are included and what they might mean. Then, in the final frame of reference, embrace your nature… but not too much. That is after all how Narcissus suffered his own fate. … a young man kneels at a still water’s edge to gaze on his own reflection, viewed as if from suspension over the pool just a few feet in front of him, black background is in stark contrast with the isolated light accents of his skin and ivory sleeves […]. It is Narcissus. He has flawless smooth skin and red, neatly coifed hair, parted by a delicate, symmetrical left ear. [In this version] He is shown upside down in the lower half of the painting, kneeling in a contorted, unclassical position – he sits shifted on a folded right leg and steeply leans forward over the water’s edge with head cocked right and elongated neck bared. He braces with wide extended arms which spread across the width of the painting. Clothes characteristic of Renaissance fashion and free of mythological references: one can make out, protruding from the shadows, an ivory shirt with wide puffy sleeves pulled up to the elbow, an overtunic of emerald velvet with intricately shaved relief-flourishes, and the knee of shiny ultramarine breeches. Such garb, associated with enfants terrible, may emphasize both his privileged station and his unruly character. His fixed expression shows longing and sadness. Trance-like, as if hypnotized, he locks eyes with those of his own dimmed reflection in the [upper] half of the painting. Narcissus and his elusive image seem to be touching hands at the water’s edge. The mirrored arches framed by his hands and arms and their reflection create an oval loop punctuated near the center by the taught skin of his bare knee – the brightest element of the composition. The painting [and this version] represent the relation of the painted character with his own reflection; an eventual self-destruction of isolated self-absorption. 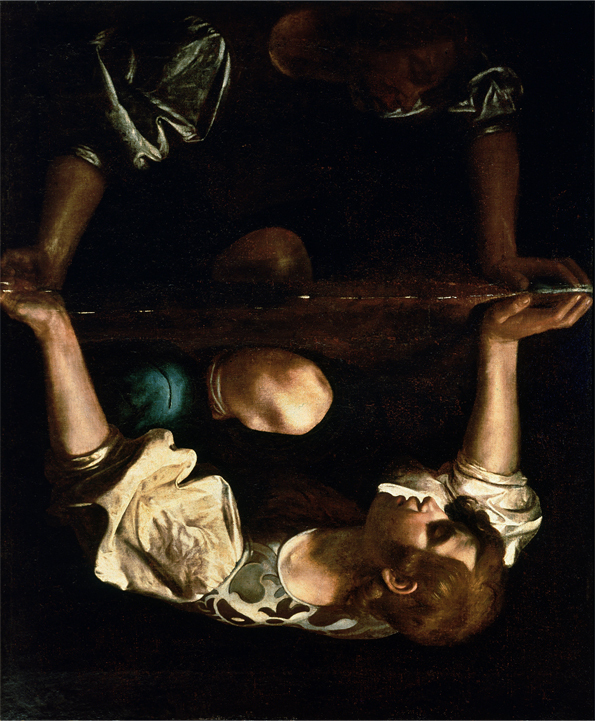 Caravaggio dramatizes the scene by his characteristic method: chiaroscuro, the interplay of light and shadow, and he makes Narcissus, as if a theatrical figure, emerge from the depth of the unlit scene. This „master of darkness and light” makes the light itself his subject – with selected portions of the work intensely lit by a light source left out of frame. Singularly lit, Narcissus’ glowing figure extends fore from the darkness to create, for the painting, that same gravity which lone campfires in dark woods draw onlookers in with.